George C. Stege III, M.D. is Board Certified by the American Academy of Family Practice and the American Board of Bariatric Medicine. He is a member of the Jefferson County Medical Association, Kentucky Medical Society, American Medical Association, Kentucky Academy of Family Physicians, and a Fellow of the American Academy of Family Practice. He is a graduate of Princeton University and the University of Louisville School of Medicine. 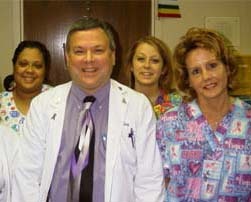 He participates in the training of medical students and residents of the University of Louisville School of Medicine. He was recently featured in an article in The Courier Journal. Lisa has been a valuable member of the Family Care Group team for almost twelve years. She is a native of Louisville and a graduate of Health Careers Institute. Lisa is the Electronic Records Manager at FCG as well as our lab manager who keeps all things running smoothly on a daily basis. She has a genuine concern for all of her patients and gives one (or more) of the best shots in town. Krystal is a graduate of Central High School and the School of Business and Banking. She has been in the medical field for 5 years. Krystal is the Insurance and Collections Manager and has recently taken on the role of Referral Coordinator as well. She has been with Family Care Group since February 1996. In her free time, Krystal spends time with her 4 year old son Jordan. She also enjoys reading, bowling and spending time with friends and family. Amber has been an intern, part time staff and full time employee at Family Care Group. In her current part time position, she coordinates the enormous task of transferring Dr. StegeÕs paper files and medical documents to electronic format. In addition to helping out as needed with the front office and lab, and she is an Endermologie and Micro-dermabrasion Technician at Family Care Group.